The first time I went to Iran, my sister-in-law made a wonderful celery stew – Khoresh Karafs. I had never tasted anything like it. Who knew celery could be so tasty as a star ingredient? Since then I had tried to find a recipe for it, but none were quite right. So, during our visit this year, I made a special request that she show me how to make her Khoresh Karafs. 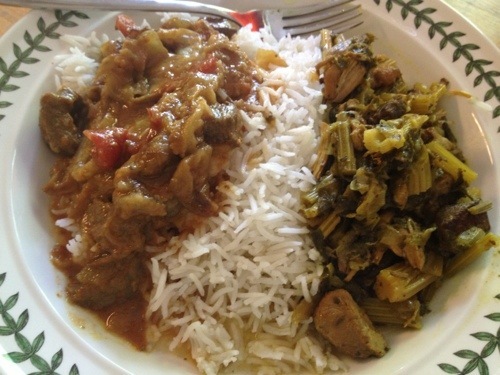 She shared with me a secret to the great flavor of her stew – adding qormeh sabzi vegetables! Remember, when I last made Qormeh Sabzi, I made extra vegetables and froze them…this is why. While I watched all the steps of cooking this using the traditional method, my mind was going over how to convert this to a slow-cooker recipe, it seemed to be a perfect candidate. All I had to do was wait until the celery in my garden was ready for harvest. My initial try ended up too watery with the celery saying a bit too crisp. So I made some adjustments, and below is the result of combining Nastaran’s recipe with my celery and a slow cooker. As with many stews, this is even better as a leftover. I put our leftovers in the freezer and a few weeks later we enjoyed a great leftover dinner of Khoresh Kalafs and Khoresh Bademjun (eggplant stew). Brown the meat in the oil. Add the onion and celery and fry on medium-low for 15 minutes. Place all the ingredients in a large slow-cooker. Sitr to combine. Cook on low for 8 – 10 hours. Taste and adjust seasoning. Add a splash of lemon. Serve with basmati rice. Enjoy! As I usually do, I made turkey stock after Thanksgiving. I made A LOT of stock, which is in the freezer (hanging out with all my tomato sauce). My friend Allan came and made us a wonderful turkey noodle soup. Allan’s soups are always delicious, so I watched very closely as he worked his magic. Then, when I decided to make some turkey vegetable soup to help ward off colds, I went to the freezer and brought out some more stock. Allan’s bouquet garni was wonderful, he made it from herbs I cut in the garden that day. Today I used herbs I had dried from the garden. I also opted to not use rosemary this time, but rather oregano. It still worked really well and imparted great flavor to the soup. Note: I would not used store bought dried herbs, they are too finely crushed. I was only making a small pot of soup, feel free to increase all the quantities for a larger pot. There is nothing like chicken (or turkey) soup to calm the senses and heal both body and soul. Place the stock in a medium pot. Add the bouquet garni and vegetables. Bring to a boil, lower heat to low, cover and simmer for at least 1/2 hour (longer is better). Serve with crackers or good bread. Enjoy! Cooks note – You can add pasta or noodles, just increase the heat to a good simmer and cook until the pasta is cooked through. Take leftover turkey, a bunch of veggies, and mix it into my homemade spaghetti sauce and you get a totally new meal – Turkey Bolognese. It is a shame to call this a “leftover” meal, since I would almost make the turkey just to be able to make this! It is a shame I made this after the girls went back to school; well maybe not such a shame, it means we have extra to use for lunches this week – that is a happy thing! This is adapted from Giada De Laurentiis’ recipe but, honestly, one of the things that made it so good was the tomato sauce I made and froze this summer. I used a lot of fresh basil in the sauce, so I omitted the fresh basil in her recipe. If you do not have a basil-based marinara, add 1/4 cup of chopped fresh basil before serving. Heat the oil in a large heavy frying pan over medium heat. Add the onion and garlic and saute until translucent, about 5 minutes. Add the carrot and celery and saute until the vegetables are tender, about 5 minutes. Add the turkey and saute 1 minute. Add the tomato sauce. Decrease the heat to medium-low and simmer gently for 15 minutes to allow the flavors to blend, stirring often (I covered my pan to retain the moisture). Taste and adjust seasoning with the salt and pepper. Meanwhile, cook the pasta until just tender, but still firm to bite. Drain, reserving 1 cup of the cooking liquid. Add to the sauce if needed (you do not need to do this if you cover the pan while cooking). Put the pasta into a large pasta bowl, top with the sauce. Mix the past and sauce, serve in individual bowls and pass the grated parmesan. Enjoy!